AMBER SLOAN is a choreographer, performer and teacher based in New York City. Her work has been presented by Dixon Place, Roulette Theater, Joe’s Pub, Soaking WET at the West End Theater, Danspace Project at St. Mark’s Church (DraftWorks and Food for Thought), Brooklyn Arts Exchange, Dance Theater Workshop (Family Matters), Spoke the Hub at Gowanus Arts, Mulberry Street Theater, 92nd Street Y Harkness Dance Center, Conversations at the Flea Theater, Location One, Dance Space Center, the EstroGenius Women in Motion festival, as well as a 17 year commissioning relationship with the DANCE NOW Festival, among others. Outside of New York, Sloan’s work has appeared at the Subterranean Art House in Berkeley, California; The Garage and Studio Garcia in San Francisco, California; Educational Center for the Arts in New Haven, Connecticut; The Yard on Martha’s Vineyard in Chilmark, Massachusetts; Summer Stages Dance in Concord, Massachusetts; Cherry Valley Artworks in Cherry Valley, New York; DANCE NOW SteelStacks in Bethlehem, Pennsylvania; Certain Bird in Stamford, Vermont; and the Katzen Arts Center at American University in Washington, D.C.
Sloan was 2015 Bessie Schonberg Fellow at The Yard on Martha’s Vineyard where she developed and premiered a new work for her company. In 2013 and 2016, her pieces were selected for the Encore Performance of the DANCE NOW Festival at Joe’s Pub, which featured the top eleven performances of the 40 plus artists presented by the festival. Other notable accomplishments include an honorable mention as first runner up for her duet “Below” in Spoke the Hub’s Winter Follies Contest, selection of her evening length work “Sunken” by the producers of Soaking WET at the West End Theater for a repeat run in their following season, and being one of fifteen artists chosen to have their work displayed in the “Inspiration” exhibit at Katzen Arts Center at American University in Washington, D.C. where her piece “Overtly Casual Displays” was projected on the wall of the museum during the month long exhibit. Sloan has received residency grants from Gibney Dance Center, Brooklyn Arts Exchange, Dance Theater Workshop (now New York Live Arts), The Field, Spoke the Hub at Gowanus Arts, Mulberry Street Theater, Mana Contemporary in Jersey City, NJ, DANCE NOW Silo in Hellertown, PA, Cherry Valley’s Artworks in Cherry Valley, NY, Certain Bird in Stamford, VT, and Summer Stages Dance in Concord, MA. She has received funding from the Jerome Robbins Foundation and The Jewish Communal Fund. As a performer, Sloan has been a member of David Parker and The Bang Group since 2002. As a principal dancer with the company, she has appeared in several prestigious theaters and festivals in both Europe and the United States including Lavanderia a Vapore in Collegno, Teatro Alferi in Asti, the Nervi Estate Festival and the Carlo Felice Opera House Auditorium in Italy, Monaco Danse Forum in Monte Carlo, OT 301 in the Netherlands, Edinburgh Fringe Festival in Scotland, the Fisher Center at Bard College, PS21: Performance Spaces for the 21st Century, Jacob’s Pillow Inside/Out, Boston’s First Night, the Provincetown Theater, Institute of Contemporary Art in Boston, SteelStacks in Bethlehem, Pennsylvania, Tampa Bay Performing Arts Center in Florida, The Yard on Martha’s Vineyard, and in New York at Dance Theater Workshop, now New York Live Arts, Symphony Space, Danspace Project at St. Mark’s Church, Joe’s Pub, the Winter Garden Theater in the World Financial Center, the West End Theater, 92nd Street Y Harkness Dance Center, among others. She has assisted Parker in his work with Anna Sokolow Theater Dance Ensemble, the Juilliard School, Barnard College, Hofstra University, Marymount Manhattan College, Hunter College and Summer Stages Dance. In addition to The Bang Group, Sloan has had the pleasure of working with Doug Elkins & Friends, Keely Garfield, Chris Elam/Misnomer Dance Theater, Sara Hook Dances and Stephen Koplowitz. She recently had the honor of performing in the revival of James Waring’s 1972 solo Tender Buttons, staged by Richard Colton, in The Bang Group’s Under the Skin program at the 92Y. 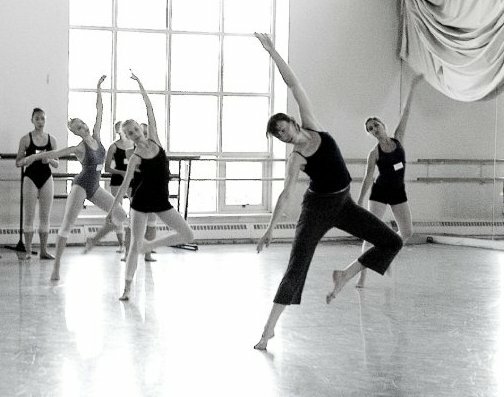 As a teacher, Sloan serves on the faculty of the Alvin Ailey School as the dance composition teacher for the professional division certificate program. She has also taught composition at the summer program of Ridgefield Conservatory of Dance in Ridgefield, Connecticut. She has taught modern dance technique at Dance New Amsterdam, 100 Grand, Brooklyn Arts Exchange, Boston Ballet’s Summer Dance Program, DeSales University and Muhlenberg College. Sloan is a co-producer and curator of Women in Motion, an organization whose mission is to foster female choreographers through commissioning of new work, producing and mentoring. In addition to their annual concert performance, Women in Motion hosts quarterly salons in informal settings for female artists to share new work and receive feedback in supportive and friendly environments. Sloan has served on the board of Dance Omi International Dance Collective since its inception in 2005. She received a BFA in Dance from the University of Illinois at Urbana-Champaign where she was recently honored with the Beverly Blossom/Carey Erickson Alumni Dance Award. .